“Where was this book seven years ago? 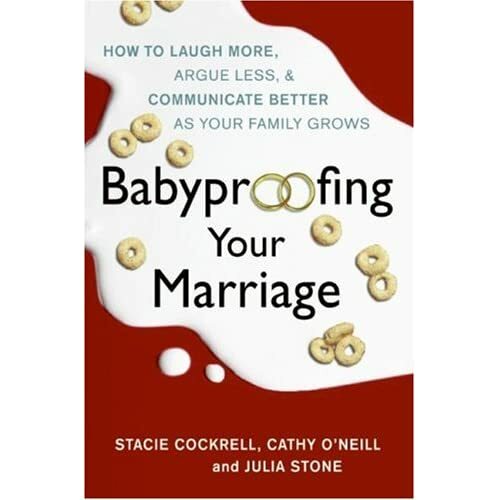 !” DH asks half in jest when I receive my copy of Babyproofing Your Marriage. On the cover are Cheerios and spilt milk with the blurb How To Laugh More, Argue Less and Communicate Better as your family grows. The three co-authors are mothers, wives and friends who know whereof they speak. The tone of the book is very casual, kind of like talking to your girlfriend. They dish out relationship advice with a touch of humor so it is less Dr. Phil more Ellen Degeneres (if she gave relationship advice). I read the book over a couple of days and found myself raising my eyebrows in surprise at some points (Really? I mean, wow, really! ), nodding in agreement (Been there, uh-huh.) and smiling in amusement (The 5-minute Fix – teehee., giggle, wink). Next → Next post: Baby Loves Disco in the OC — I was the official Mamarazzi!